To make foam, in a large bowl or in the bowl of a standing mixer, whip the heavy cream on medium high speed for 3-4 minutes until it starts to thicken. Add sugar and continue whipping until very soft peaks begin to form, 3-4 minutes, more or less. Stir in the vanilla and butter and whip for another 30 seconds or so. Stop just before it reaches the consistency of whipped cream. 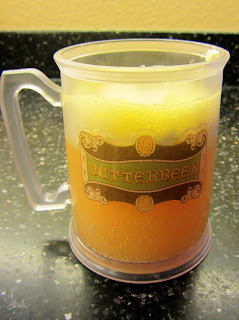 To make butterbeer, in a large microwave safe mixing bowl, microwave butter and butterscotch topping until hot and bubbly, about 1 minute. Add 2 cups of the club soda, mix well, then add the rest of the club soda and do not mix (to keep the carbonation). 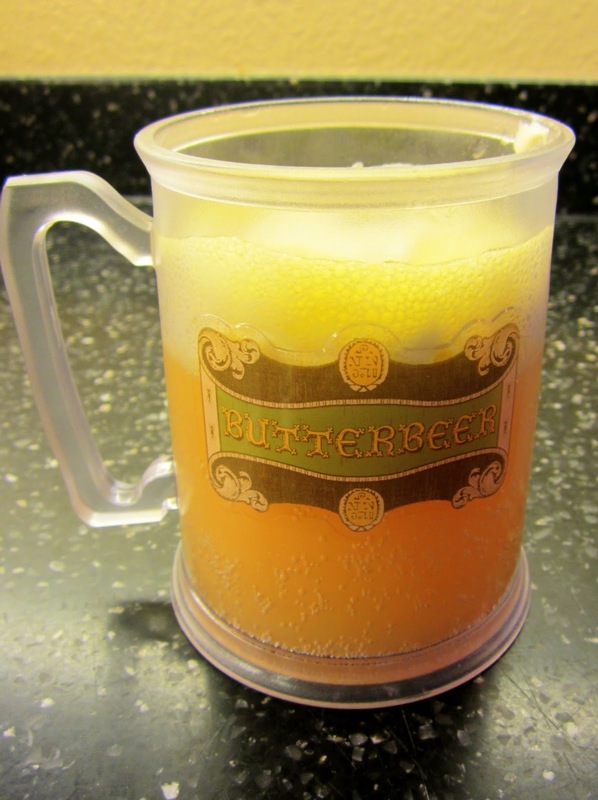 Microwave the butterbeer for 2-3 minutes, or until the butterbeer is warm. Ladle into glasses and add 2 spoonfuls of foam to each glass. I did it. I finally did it. This is it! This is the absolute best recipe I have ever tried. And trust me... I tried a lot of them! I tried everything from different brands of cream soda to butterscotch pudding mix in the foam to adding a bit of ginger beer (that last one tasted gross) and after many many trials, I have found the perfect butterbeer recipe. It's not overly sweet, it tastes buttery and butterscotchy, it is warm yet still bubbly, and if you buy Smucker's butterscotch topping, it turns out orange! If you find yours is not as orange as you want it to be, feel free to add a bit of food coloring, but add it before you add the rest of the club soda if possible, so you don't destroy the fizz. And if this recipe is still too sugary for you, go ahead and add more club soda. Club soda is the secret! It doesn't add sugar, like cream soda does. And it may seem like that's a lot of butter and butterscotch syrup to be consuming, but when you think about it, you are only adding carbonated water to it, so it's not that bad. Enjoy your authentic butterbeer! 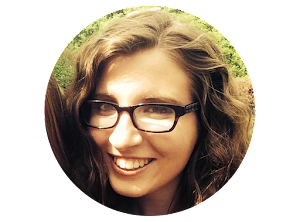 And if you have questions feel free to comment below or shoot me an email! A few days ago, I discovered possibly the most weirdest ship ever. 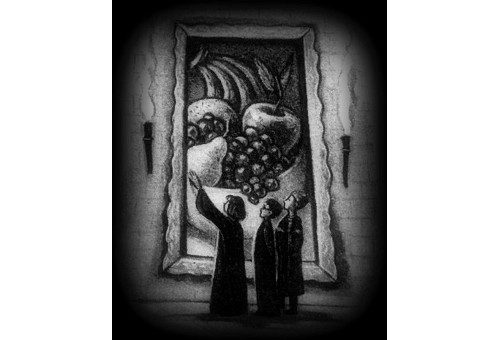 Drapple. I actually find this quite hilarious. So I have decided, as of a few seconds ago, every time I post a recipe with apples in it, I will also post a drapple photo. Just because it's funny. I have stumbled across a lot of ridiculously hilarious Harry Potter photos recently, thanks to the FB page The awkward moment when your beloved rat turns into a human. They probably post 30 funny pictures a day... which is not a problem, since we all know that anything Harry Potter is my favorite pastime. Without further ado, I give you... DRAPPLE. 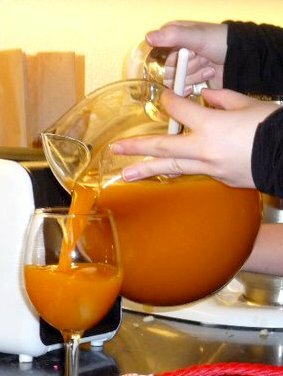 In a pitcher that will hold at least 9 or 10 cups of liquid (or at least 2 1/2 quarts), open can of pumpkin and spoon into the pitcher. To make stirring easier, add the white grape juice and stir well, then add the rest of the liquid and stir to combine. Refrigerate immediately or serve over ice. The pumpkin will settle to the bottom over time, so stir before serving.